Betty was married at twenty. 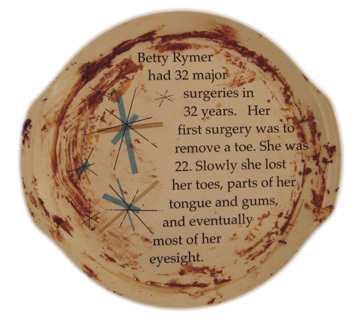 She had her first of 32 surgeries at twenty-two to remove a toe. Poor circulation connected to diabetes was a constant issue for her and the cause of most of her health issues. She eventually lost most of her toes, parts of her gums and her eyesight. When she was diagnosed at eighteen, it was generally assumed she would not live very long. Betty must have reacted in opposition. Betty spent much of her life performing extreme acts to publicly hide her disease. Her choices, to stay in college, get married, have children, bowl, et cetera, suggest she believed she had autonomy and could, to a large degree, control her life.